(Jamaica Gleaner) Fly Jamaica Limited has been awarded US$4.2 million in damages for breach of contract against ADS Global Limited, the company that operated the airline’s call centre from 2012 to 2014. Judgment was handed down yesterday by Justice Carol Edwards in the Commercial Division of the Supreme Court. The airline, which began operations in 2012, claimed that ADS Global acted unlawfully by closing its call centre on May 18, 2014, without proper notice. The airline contended that less than five days’ notice was given. According to the airline, ADS said that the closure was because of the airline’s failure to pay for services rendered. The airline contended that it had disputed certain invoices for payment. However, the court found that at the time the centre was shut down , Fly Jamaica had not been given the required 14 days’ notice as stipulated in the contract. The shutting down of the call centre sent the airline scurrying as passengers and potential customers were unable to reach the company to make reservations or to receive any information on flights that had already been booked. Attorney-at-law Stacey Knight of the law firm Knight, Junor & Samuels, which represented the airline, said that to add insult to injury, at the same time when the call centre was shut down, ADS also directed Columbus Communications Limited, which was then trading as LIME, to disconnect the airline’s telephone lines and Internet services. At the time, ADS was acting as a reseller of Columbus Communications Limited Services and was therefore a middleman between the airline and the telecoms giant. The court found that this action, too, was a breach of contract by ADS Global because at the time, Fly Jamaica was up to date on all its telephone and Internet bills. 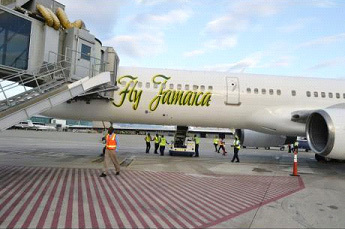 The losses were estimated based on Fly Jamaica’s brief track record and the company’s projected growth. ADS had contended, in its defence, that adequate notice was given and had made a claim against Fly Jamaica for US$50,000 owing, which the court granted.